The Minnesota Whitecaps have made history. In their first NWHL season, they are Isobel Cup champions. 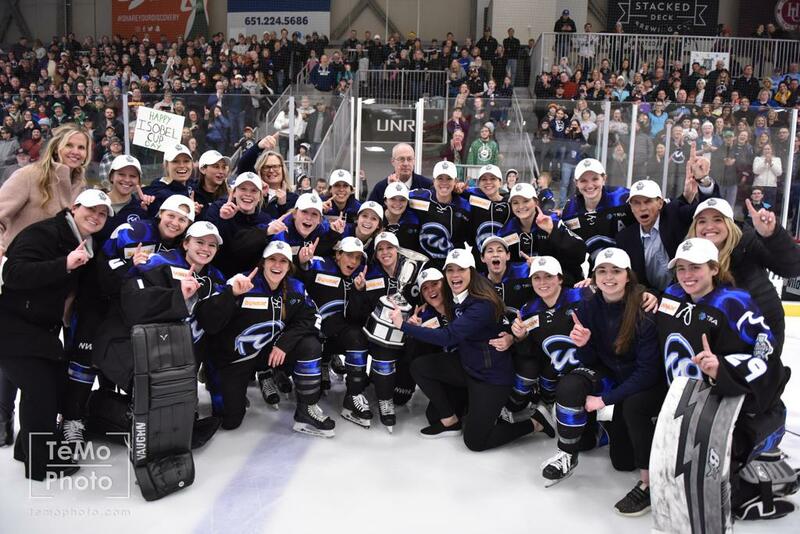 Lee Stecklein scored 49 seconds into overtime to give the Whitecaps a 2-1 win over the Buffalo Beauts in an absolute thriller of an Isobel Cup Final. The teams engaged in a defensive battle for much of the game, with the two goals in regulation both coming in a span of 1:22 at the end of the first period. Amanda Leveille made 22 saves in the win, while Beauts goaltender Nicole Hensley stopped 28 shots. Stecklein was named MVP for her efforts both in scoring the game-winner and on the defensive end. Both teams were outstanding defensively in the opening half of the first period, keeping scoring chances to the perimeter so Leveille and Hensley could see every shot. But the Beauts broke through on a power play with less than 3 minutes remaining in the first when Emily Pfalzer’s wrister from the point found the back of the net. Amy Menke tied it up with 1:37 left in the first when she took a pass from Kendall Coyne Schofield and picked the top left corner on a breakaway. The Beauts were without the services of legendary goaltender Shannon Szabados, who led the team to their semifinal victory over the Riveters on Friday but was announced as sidelined day-to-day with a lower body injury. However, Buffalo is deep in how and had the luxury of employing another great, Nicole Hensley, between the pipes. The stifling defense continued in the second period, with both teams playing physically and refusing to allow golden scoring opportunities. Both teams had opportunities to pull ahead in the third, but Leveille and Hensley once again stood tall. The Whitecaps had a power play late in regulation, but an incredible save from Hensley kept the game even. Leveille matched it with a save late in the period. The Whitecaps didn’t waste much time putting the game to bed in overtime. Katie McGovern won a faceoff back to Stecklein, who fired into the back of the net to give the Whitecaps the victory. 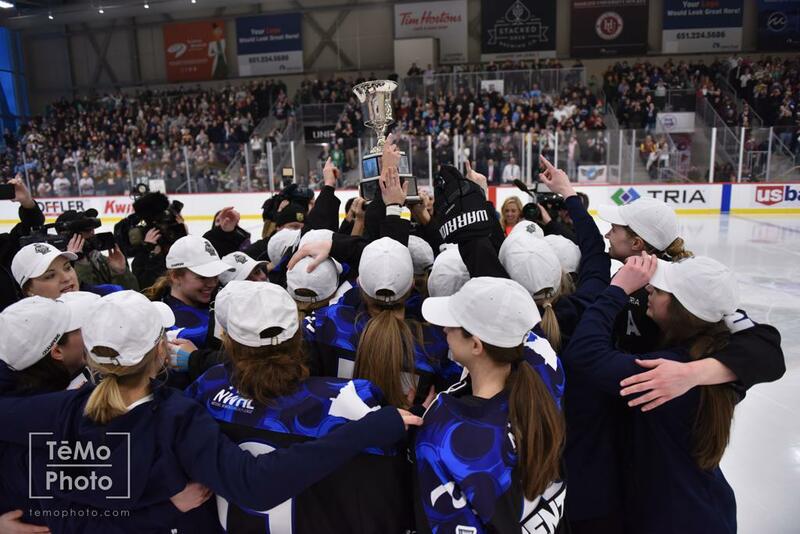 -The Cup Final was the tenth consecutive sellout at TRIA Rink for the Whitecaps in their first NWHL season. “For all the expectations we had for the NWHL in the State of Hockey, they were surpassed by the teams, fans and community,” said NWHL Founder and Commissioner Dani Rylan. -Leveille is a two-time Isobel Cup champion after winning with the Buffalo Beauts in 2017. -Stecklein finished the game with a goal and an assist. -This was the first time since the NWHL moved to single-elimination playoffs that the Isobel Cup Final has gone into overtime. -Corinne Buie, a member of the Buffalo Beauts, has appeared in all four Cup Finals.